Yesterday was a short day for class. We finished after lunch. We went to the newish Orthodox congregation on the south part of Akademgorodok to purchase icons. 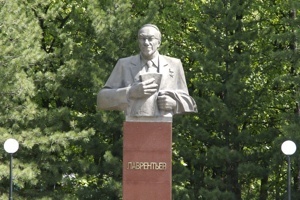 On the way, we passed the bust of the founder of Akademgorodok. He’s quite a good looking guy, don’t you think? 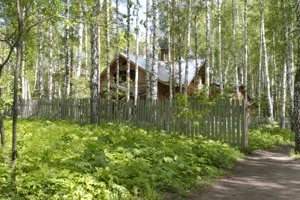 Akademgorodok is unique as the many institutes of study here were established before the university. Typically the advanced institutes were created after the university, following its offerings. 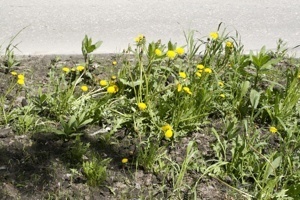 While Akademgorodok is known for its large and fierce mosquitos, just as prominent are fierce dandelions. They are everywhere and quite large. The church is relatively new although the cedar smell internally has taken a back seat to the smell of incense. Here again you can see the pervasive cedar trees. 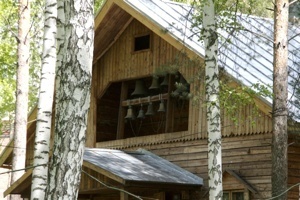 The church is fully functional with bells, icons, inner sanctum (or whatever they call it.) There were no pictures allowed inside. We purchased a nice icon of Jesus for our trip souvenir. The priest arrived when we were leaving. He was clearly orthodox and very hairy. At the end of the path were a set of renovated or newer buildings. These taller buildings are unique. Most of the buildings are commonly referred to as “Kruschev” apartments. The majority style is a four story long building. I understand Kruschev said that the USSR would surpass the US in 1970 in economic production and reach complete communism in 1980. While this didn’t play out, the buildings were only built to last until 1980. The money to renovate these is starting to flow but the majority are dilapidated. They’ve painted many of them to provide some contrast. We walked back to the bus, went home, took a nap, had some dinner, and then watched the 2006 film “the Fountain.” We’re dealing with end-of-life issues and this film touched the same nerve. I’ll probably blog about it someday.